So, you have decided what kind of postmark you are going to collect. If the answer is traditional first-day-of-issue postmarks, digital color first-day-of-issue postmarks, or pictorial postmarks, let me introduce you to your new best friend: The USPS Postal Bulletin. Published by the United States Postal Service every other week (on Thursdays), it is the official source of updates to Postal Service policies and procedures. That isn't my summary, by the way. That's the publication's actual tagline. Whether that's a catchy tagline or not, it is not just for postal employees, though that does take up the bulk of each issue. The Bulletin also lists upcoming First Day of Issue ceremonies, addresses where you can send your envelopes to be serviced as first day covers, and upcoming pictorial cancellations. If you are going to collect hand cancels from towns, your best reference source is the "Find Locations" feature on the USPS website. Be sure to constrain your search to "Post Offices™", or else you will get matches for grocery stores, self-service kiosks in malls, and so forth. Now perform your search. Looking for a city and state is always a good start. Let's say we are performing a search for "Cincinnati, Ohio". 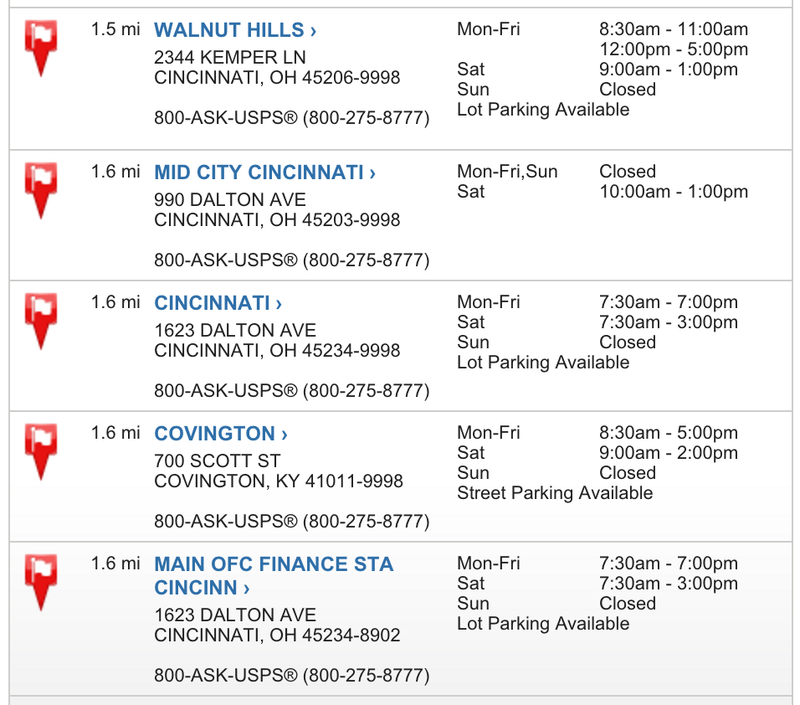 We run the search, and find out that there are at least 50 post offices within 20 miles of what the USPS considers the center of Cincinnati. See those bold blue entries in the "Locations" column? Those are called "station names". This is relevant because some of these stations — even those within the city of Cincinnati — are not going to have rubber stamps that say simply "Cincinnati", or even say "Cincinnati" at all. Sometimes there will be a station name on the cancel in addition to the city name. Sometimes it will be instead of the city name. Sometimes the station name (if that's what you're looking for) won't be available, period, and all you'll end up with is "Cincinnati" from that station. Basically, if you are looking for a clean "Cincinnati", your best bet is to write to the Cincinnati station in Cincinnati. If you want a "Walnut Hills Station" postmark, your best bet (of course) is to write to the Walnut Hills station. But be forewarned that you might not get your desired outcome. Populous cities especially are notorious for having unexpected behavior with their numerous station names. Going to town, but don't know which one? This site offers a Post Office Search function that autocompletes names of U.S. post offices that offer postmarks and gives you links to the USPS site. This is great for thematic collecting. Try typing the word "Love" and see what post offices in the U.S. begin with the letters L-O-V-E.